Written by Pomeranian Breed Authority Denise Leo of Dochlaggie fame. Pomeranian dog training guide contains essential Pomeranian Adult and Puppy training techniques. Which are both remarkably effective and fun for both owner and dog. 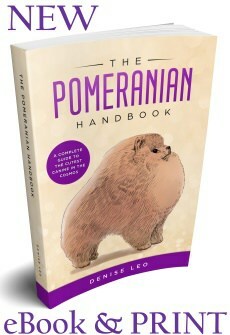 The must have book for All Pomeranian Parents. Starting your new puppy off on the right paw. Basic dog training for owners and puppies. House training for puppies and older Pomeranians. How to communicate with your Pomeranian. How to understand your Pomeranian’s body language. Learn how to teach the commands “COME” “STAY” and “SIT”. How to handle behavioural problems, aggressive behaviour. Controlling excessive barking, understanding why your Pomeranian barks. How to deal with nipping or biting, chewing, jumping on people. Teach your Pomeranian to enjoy grooming. Training a show Pomeranian puppy, baiting, gaiting and table training. Train your Pomeranian. 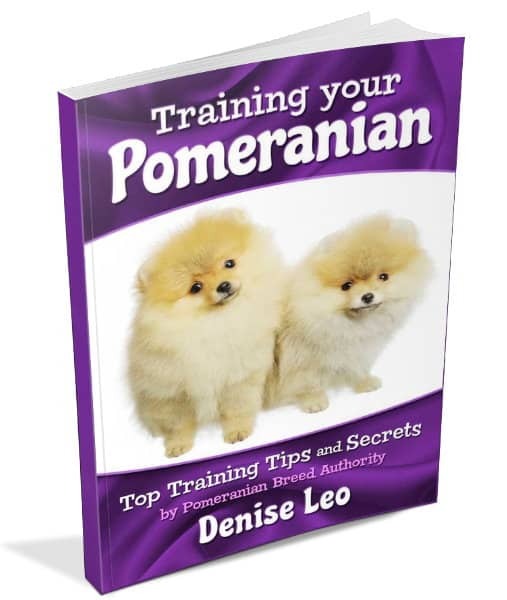 Top Training Tips and Secrets is available here on THE Pomeranian Information Site as an eBook in PDF format. Download and store on your computer, tablet, phone and print a hardcopy if required. Training your Pomeranian is also available at Amazon.Com in Kindle format an other outlets including iBooks, Nook, Kobo, Copia, Gardner Books, etc.